This Ashkenazi (Eastern European) Jewish stuffed cabbage recipe or holishkes is a traditional dish for Sukkot, the harvest festival in autumn, but it is enjoyed year-round by Jewish communities in Europe, the United States and the Middle East. This recipe has a sweet-sour sauce with raisins and is adapted from "The Hadassah Jewish Holiday Cookbook" edited by Joan Schwartz Michel (Hugh Lauter Levin Associates, Inc., 2002). Here are more stuffed cabbage recipes. Remove core from cabbage. Place whole head in a large pot filled with boiling, salted water. Cover and cook 3 minutes, or until softened enough to pull off individual leaves. You will need about 20 leaves. To make the sauce: Place tomatoes and their juices in a medium-large saucepan. Crush tomatoes with a wooden spoon. Bring to a boil, reduce heat and cook 15 minutes or until slightly thickened. Stir in onion, apple, lemon juice, white and brown sugars, sour salt, raisins, kosher salt and pepper, and return to a boil. Reduce heat and simmer 15 minutes longer. Add more sugar or more lemon juice for the sweet-sour taste you prefer. Set sauce aside. To make the filling: In a large bowl, mix ground beef, grated onion, eggs, rice, if using, matzoh meal, 2 1/2 teaspoons salt and 1/2 teaspoon pepper, mixing thoroughly. Don't overmix or the meat will become tough. To assemble the rolls: Place about 1/2-cup of meat on each cabbage leaf. Roll away from you to encase the meat. Flip the right side of the leaf to the middle, then flip the left side. You will have something that looks like an envelope. Once again, roll away from you to create a neat little package. Spoon thin layer of sauce in the bottom of a large casserole dish or Dutch oven. Chop any remaining cabbage leaves and place over the sauce. 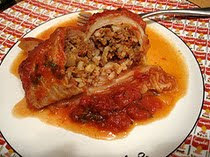 Arrange cabbage rolls, seam-side down, on top of the chopped cabbage leaves in as many layers as necessary. Pour remaining sauce over stuffed cabbage. Bring to a boil on the stovetop, reduce heat to low, cover and cook 1 1/2 to 2 hours or until filling is cooked and cabbage is tender.